The 1950s vintage bug has bitten me! I especially adore the cashmere-beaded cardigans. 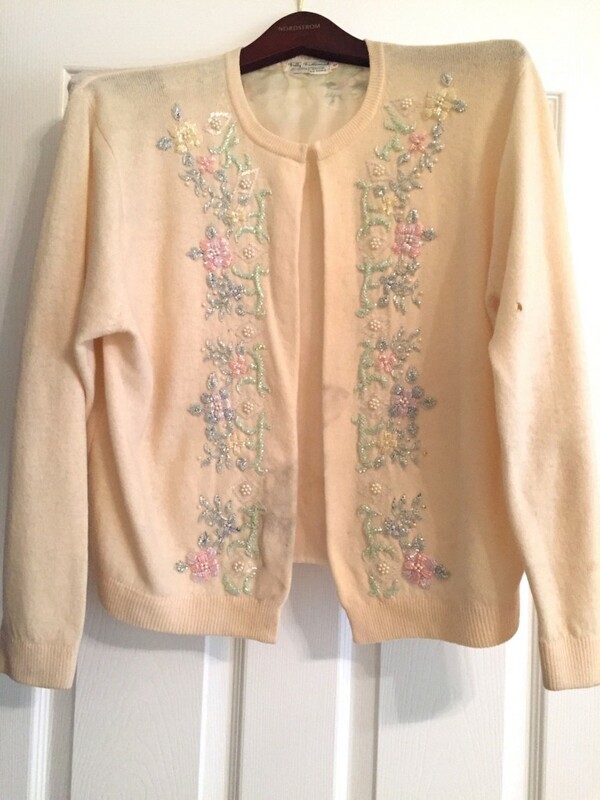 I am starting a collection, much to the dismay of bank account , however, these 1950s vintage cardigans are made from absolute quality materials and the beading work is usually all hand done so there is so much to appreciate on these 60+ year old items. 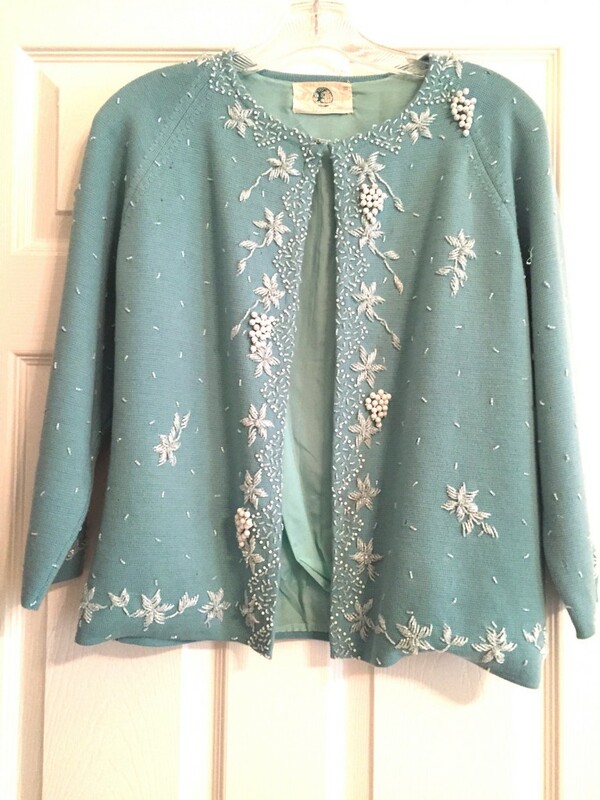 So, if you are fortunate enough to have inherited some or maybe even purchased your first vintage 1950s beaded cardigan, here are a few tips on how to properly care for them. Moth Holes: Many cardigans will come with their share of moth holes. You can actually fix the holes using a fine needle and single thread. Sew in a circle rather than line and be very gentle. 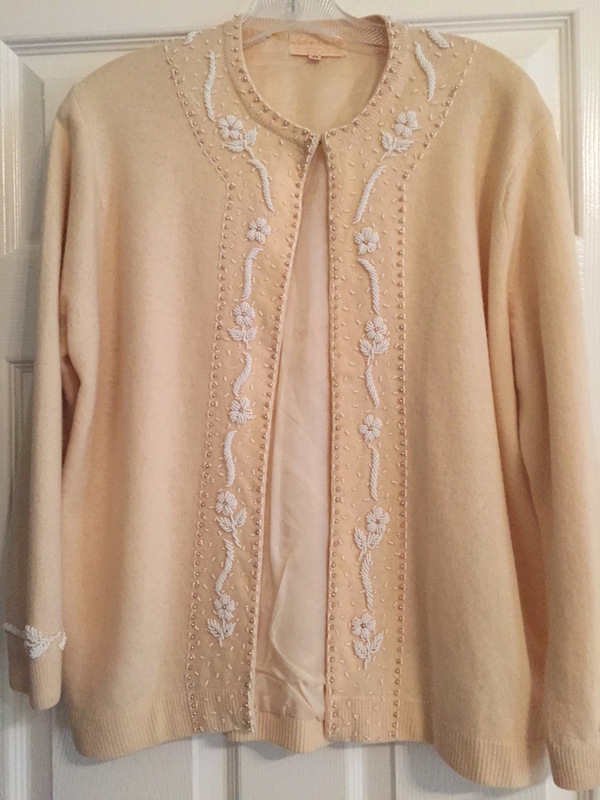 Cleaning the Cardigan: Many vintage 1950s beaded cardigans are washable by hand as long as they have a nylon silky lining. A little Woolite will do wonders. Remember to be very gentle. Drying on a sweater rack works really well. If your cardigan has pilling, do not use a shaver, as this will tear the delicate material. Rather, be gentle and pull the pilling off. Storing the Cardigan: If your cardigan had its share of moth holes, then you know just how delicate and prone to moths they are. If you have a cedar chest, then by all means store it in there. If using a dresser, then folding your sweater with tissue paper tucked into the folds along with some mothballs or moth repellant sachets. This will protect your cardigan and preserve it for many years and wearing’s to come.